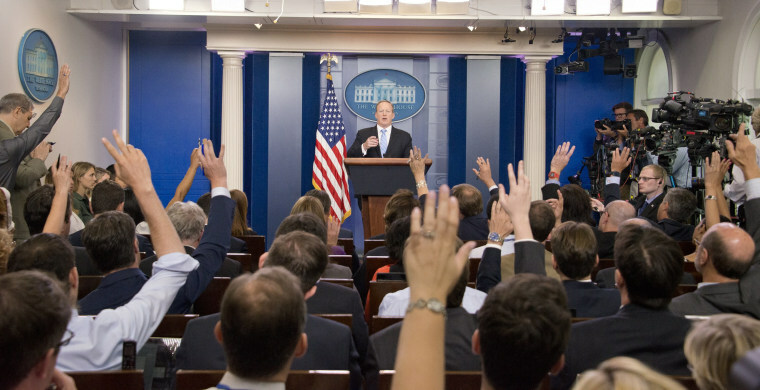 WASHINGTON — The news media have faced a lot of criticism this year, particularly from the White House and conservative opinion leaders. But the press’s role as a watchdog is still very popular with most people in the United States who are not Republicans. The most noteworthy finding in the data, however, may be the split between Democrats and Republicans on the question. Democrats were strongly in favor of the watchdog role: 89 percent said it prevents political leaders from doing things they shouldn’t be doing, while only 9 percent said it prevents them from doing their jobs. Republicans had the opposite view: Only 42 percent of Republicans said they believe the media’s watchdog role prevents political leaders from doing things they shouldn’t be doing, while 56 percent believe it prevents political leaders from doing their jobs. That split is not a big surprise. Pew Research has asked this question since 1985, and the partisan feelings on it have ping-ponged depending on which party held the presidency. In 1985, when Republican Ronald Reagan was in the White House, 71 percent of Democrats and 65 percent of Republicans said the watchdog role prevents leaders from doing things they shouldn’t. In 1994, with Democrat Bill Clinton in the Oval Office, Republicans felt stronger about the watchdog role, 72 percent said it stops leaders from doing things they shouldn’t while only 62 percent of Democrats said the same. In 2005, it flipped again under Republican George W. Bush, 72 percent of Democrats and 44 percent of Republicans said that the watchdog role was a brake on malfeasance. And in 2009, under Democrat Barack Obama, you guessed it, Republicans were supporting those crusading journalists, with 65 percent supporting the watchdog role, while Democrats were less enthused at 55 percent. But this latest set of numbers from Pew is meaningful for a few reasons. First, the partisan gap is at an all time high, 47 points. Among Democrats, 89 percent say the watchdog role stops leaders from doing things they shouldn’t, while only 42 percent of Republicans did. That 42 percent number for Republicans also represents an all-time low in the survey. Second, in this survey, Republicans are out of step with a long list of demographic groups on the watchdog issue — even groups that tend to hold a more favorable view of President Trump. When you break out the poll respondents by age, education level, region of the country and urban, suburban and rural Americans, every one of those groups believes the journalism’s watchdog role mostly keeps political leaders from doing things they shouldn’t. And they don’t think that by a little bit, but by a lot, more than 60 percent of every group. There are some clear differences on the question. Younger people, 18- to 29-year-olds, tend to be more supportive of the watchdog role (78 percent) than older people, 65 or older (68 percent). College graduates (76 percent) tend to be more supportive than those with a high school diploma or less (66 percent). And urbanites (75 percent) are more likely to think the watchdog role prevents bad actions than rural people (64 percent). But in the divided environment of 2017, where most everything is viewed through a political lens, getting at least 60 percent support from all those groups on anything is close to a miracle. This poll was conducted in March and attitudes may have shifted since then, but the adversarial relationship between the White House and the media is not recent. It’s been one of the constants of this administration. And these numbers suggest the limitations of the Trump Administration’s focus on the news media. His rows with the press may fire up his GOP base, but outside of that limited group, it’s unlikely to help him win converts or expand his support.